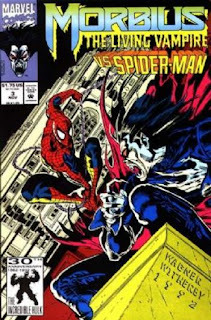 I find that in many Spider-Man books (let's face it...any Morbius title in the 90's is basically a Spider-Man title) the writers are constantly trying to show that Peter Parker/Spider-Man is a normal guy that readers can relate to. Beyond having Spidey swing through real parts of New York writers often place pop-culture references into his dialog such as they have in Morbius: The Living Vampire #3 when he mentions at midnight, that he would rather be at home watching Letterman. A statement like that would be ok if done correctly, but maybe the editors and writer should actually watch Letterman to know what time his show is on. This issue was created in 1992 while Letterman was still on NBC's Late Night with David Letterman which aired at 12:30 a.m.. He did not switch to CBS, taking a 11:30 p.m. time slot until August of 1993. If Spider-Man was out at midnight he could still get home before Letterman started. Little things like that bug me. Besides that, another thing which caught my eye was a note by Stan Lee at the very end of the comic of the day, which I'm sure was at the end of many Marvel comic books during Morbius: The Living Vampire #3's release. Stan Lee announces that a new X-Men animated series will be coming to the Fox network. The X-Men show in the announcement is of course the hugely successful Marvel comics show which ushered in a whole new comic book generation of buyers. I guess I assumed a new Marvel television show would be advertised in Marvel's comic books, but until today I had never seen the actual announcement. Just kind of a neat thing to read...for history's sake. Nerd history, of course. On a side note...I hear Morbius was in today's issue, as well.